I have a few pieces of sports memorabilia I have collected over the years. This one is my most prized piece and today’s entry in my Photo-a-Day project. 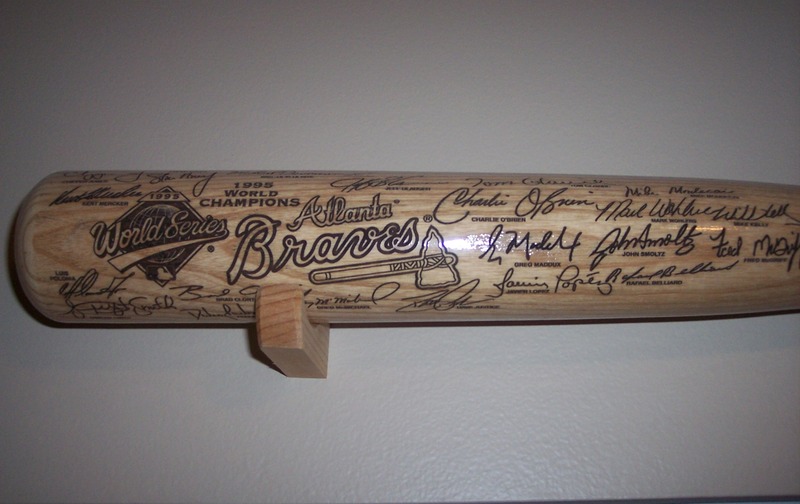 This bat was issued to commemorate the Atlanta Braves 1995 World Series Championship. It is a Louisville Slugger and is autographed by every player on that championship team. The autographs, however, were actually etched into the wood. The Braves issued 5000 of these bats, and each is numbered. Mine is number 1003. I have been a Braves fan since I was a kid and was living in Atlanta when they won the Series in 1995, so this piece is very special. It is one of those things that I would never consider selling and one day will be passed down to my kids. If you’re ever at my house and would like to see it I’ll be happy to show it off. I have 214 of 5000 how much is it worth?